Bikes made for people who ride, by people who ride. Weis Manufacturing is rooted in a community of riders and racers who share a common love for going fast and getting rad. 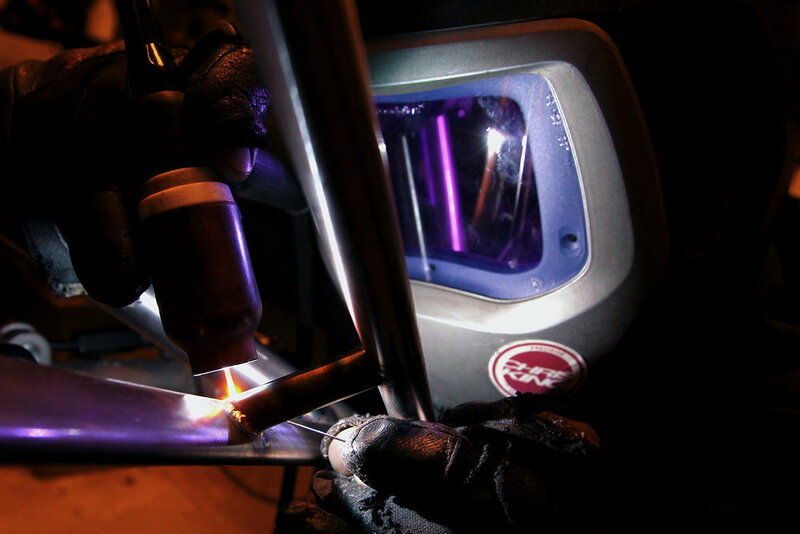 We design, prototype and produce all of our bicycles in our Brooklyn, New York fabrication shop. Your frame is mitered, welded and aligned under high scrutiny and is guaranteed to be a unique, finely crafted ride. All Weis Hammer models feature an asymmetrical rear triangle with the extra stiff Speed Stay -TM drive side, ensuring direct power transfer from the pedals to the pavement. Now Available in Columbus Zona 4130 alloy steel or 7005 aerospace aluminum alloy tubing. The Weis Hammer Track is a race tested machine. Whether you are riding in the velodrome, alleycats or criteriums, this bike is built for going fast and having fun. All of our frame designs are race tested by top tier athletes.